I have no idea why dry shampoo isn't a huge topic in the beauty world. It has to be one of the products I can't go without. They say you can use it right after a shower to give your hair more volume (which I have yet to try! ), as well as using it to give a matte finish. I can't believe I survived so long without it. My mom told me stories about how baby powder was used in the sixties and seventies by hippies, so they could avoid showering, so I've always been curious about this method. Experts say washing your hair too much can be damaging, which is another reason why dry shampoo is a marvelous invention. Dry shampoo has been a life changing product for me in the past few years and I use it religiously. I am now able to get by without washing my hair everyday. Not only is it a great way to train your scalp to produce less oil, it also gives it that desirable matte finish, without stripping the natural oils of your hair. I've tried using baby powder, but it doesn't give the same effortless finish that the spray nozzle projects and I can never seem to get the white hue out of my hair with powder. 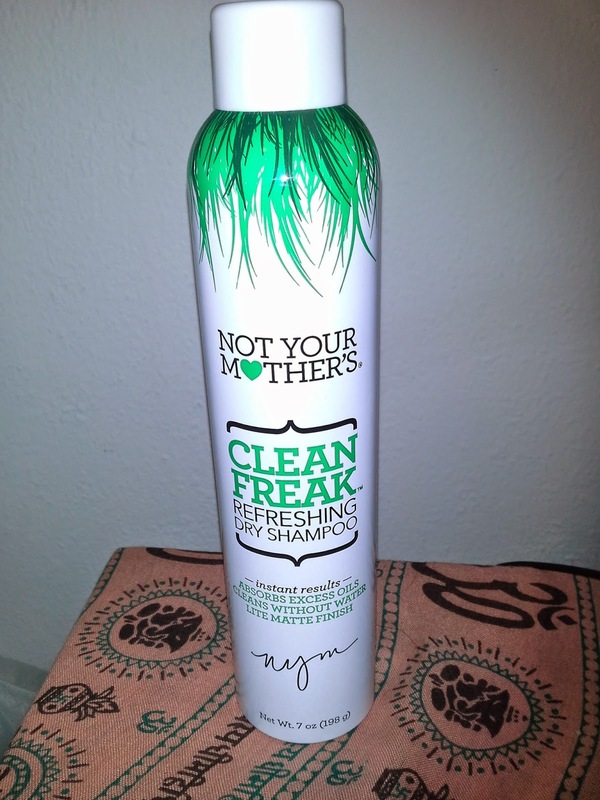 I find with Not Your Mother's Clean Freak Dry Shampoo, it is much easier to blend the spray in or just let it absorb. I usually apply it the night before or the morning of my no-poo day. I concentrate on the front-top part of my hair, while aiming it at a far enough distance, so I avoid getting an obvious white spot on scalp. If I concentrate too much, then I'll have to rub it in and this can be frustrating. With powder, I find blending it out a little more difficult. Unfortunately, my hair is quite thin and dark, so it is super obvious when I haven't washed it. I've tried other dry shampoos and this has been my favorite so far. It has a pleasant, fresh smell and does not discolor my hair, as long as I apply it properly. With some dry shampoos, there isn't a lot of product in the spray can, but this one seems to last me a few months, while using it every other day. Unless I see another dry shampoo that I want to try, I'll be repurchasing this once my current one is empty! This is usually sold in CVS, Ulta, Walgreens and some local grocery stores for around 5.99$.